The Annapolis sailboat show has many racers and cruisers on show. So in October we took the opportunity to see how each type, cruiser or racer, tackles mainsail reefing. This was a great opportunity since all the major boat manufacturers and brands are on display. See survey below. Slab reefing systems incorporated 3 types. Bolt rope and slides, lazy jacks and Dutchman systems. The performance cruisers use systems to capture the mainsail when it drops, like the Dutchman and lazy Jacks systems. I was surprised to see so many lazy Jacks as IMHO the Dutchman system is the better system, as it flakes the sail as its drops, but it is also more expensive. Performance orientated boats including the racers tend to go with slides or bolt rope and slab reefing. In mast furling is a very popular method of main sail handling as its found on many of the major production Boats. 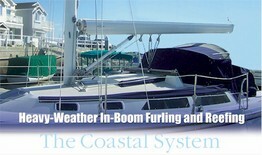 Roller furling Booms are typically found on high end and larger boats and many use the Leisure Furl from Forespar. Boats in this category are the Trintella, Morris, Hylas, Friendship etc. Hylas had the GMT boom. Slab reefing is the most traditional & simplest form of reefing. 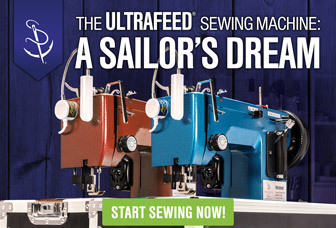 You only need some grommets in the sail and some blocks and reefing lines to make this system work. The slab reefing system is the cheapest simplest and easiest to add to your main. This Harken diagram details the blocks and lines you need to assemble a slab reefing system. Single Line reefing makes slab reefing simple. Instead of a reef line for the tack and the clew, there is one line for both. The process of reefing involves easing the main halyard to the desired point and then taking up on the single reef line. The line starts by pulling the tack of the main down tightening the luff and then the load automatically pulls the leech tight. Slab Reefing works with a bolt rope or luff slides and can be incorporated with either Lazy Jacks or the Dutchman system. The other types of reefing are in Mast Furlers or in Boom Furlers. The basic design is a roller furler unit fitted inside a mast section that has a slot in the aft end that the mainsail rolls in and out of. This mast section is larger than normally required and may require less spreaders due to the extra stiffness. The mainsail because it furls like a jib cannot support battens, hence the mainsail needs to be cut with leach hollow like a jib/genoa. 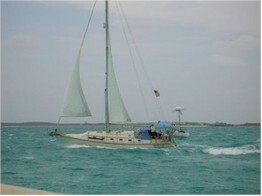 The Sparcraft in mast furler is one example of in mast furlers, see image. In mast furling although a very convenient furling system it does has its pitfalls. 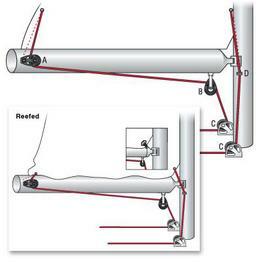 The Z Spars link to in mast furling help describes some of the pitfalls and how to overcome them. 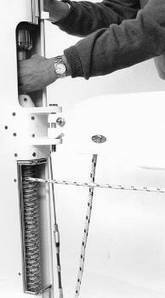 The Boom Furling system works similarly to slab reefing. The main halyard is dropped and the lower part of the main sail is rolled up into a mandrill located inside the boom. One critical feature of boom furlers is the angle of the boom to mast. This is specified by the manufacturer and you will need some sort of solid vang to control this angle. A list of production yachts at the Annapolis Boat Show using Boom furling include; Hylas 70ft, Trintella, Niad, Cabo Rico, Westsail 42, Saga, and Tartan 4400. There are several Boom furlers including Schaefer BoomFurl, GMT PowerFurl and FurlBoom and Forespar/Leisure furl among others. Forespars Coastal system is the smaller boat version of the Leisure furl boom furler and is shown on the Catalina 30 pictured below. The coastal system has the furling drum in the boom at the aft end and so does not go through the mast, unlike the traditional Leisure furl. The survey is based on all boats over 28ft. The boats using In mast furlers are the larger production builders, Catalina, Hunter, Beneteau, Island packet etc. Since this survey was done in 2008 we have checked the results every year and similar patterns show today as did then. So if you wonder which is the most popular reefing system it seems slab reefing is. We broke out the 75 boats with slab reefing into 3 parts, Bolt rope, Lazy jacks and the Dutchman system.